Daisy Perez, owner of Art With Daisy, is a fantastic artist and art teacher who lives and works in Northern Illinois. Daisy teaches most of her art classes out of Julie's Coffee in Lake Villa, IL, where she also displays her personal work for purchase. 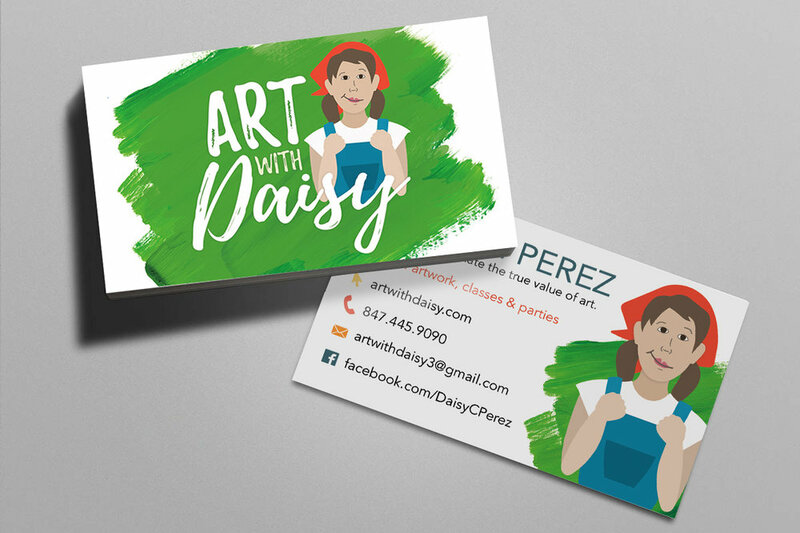 Daisy came to me looking to create an easily-recognizable brand for herself. When I asked her what she was looking for in a logo, she specifically asked for a caricature of herself, wearing a red bandana and overalls (what she wears most often). I presented her with a wide variety of color and typography options, and we ultimately decided to go with the look you see below! Here you can see one of the final steps in the logo selection process! I presented each of the logos above to Daisy individually, and she decided she liked the option with the green background. Daisy often hands out her business cards to new patrons of the coffee shop, or new members of her classes. She loved the combination of the realistic paint photography behind her logo, playing off of her original flat logo.